I have observed leaf mold of tomato in greenhouses and high tunnels recently. This article will discuss this disease and management options. In the last issue of the Hotline, I discussed Botrytis gray mold. I noted how gray mold is favored by the cool, cloudy weather we experienced earlier this spring. The warmer and sunnier weather we have experienced more recently should favor leaf mold over gray mold. Leaf mold is caused by the fungus Passalora fulva. 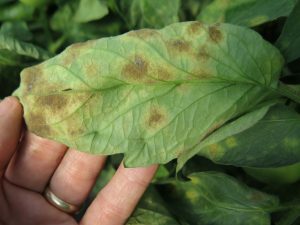 Cercospora leaf mold of tomato is rare in Indiana and is discussed here (https://vegcropshotline.org/article/cercospora-leaf-mold-of-tomato/). The first symptom of leaf mold one is likely to notice is a pale yellow lesion on the top side of the leaf (Figure 1). When the leaves are turned over, the fungal mold that gives the disease its name becomes evident (Figure 2). Leaf mold often becomes a problem under humid conditions (85% humidity or greater) and temperatures between 71 and 75°F, although leaf mold can cause infections at temps between 50 and 90°F. For the most part, only leaves are affected. The spores produced on the underside of leaves are readily airborne and spread easily from leaf to leaf. Leaf mold is more common in a greenhouse or high tunnel than in the field. Figure 1. Upper side of tomato leaf with leaf mold. Figure 2. Underside of tomato leaf with leaf mold. Tomato plants with resistance to leaf mold are available. For example, we have noticed in our experiments at the Southwest Purdue Ag Center that Mountain Spring is susceptible while, for two years, Red Deuce was resistance. However, the fungus is variable and may overcome resistance. Crop rotation can help to reduce plant residue. If tomatoes are grown year after year in the same location, remove as much of the crop debris as possible from the greenhouse after the last harvest. However, we have observed that even though we remove all tomatoes at the end of the season, leaf mold shows up earlier each year. No doubt, leaf mold would be more severe if more crop debris were left in the soil. Space plants appropriately and prune lower leaves to improve air circulation. Reduce humidity in greenhouses by venting the structure before nightfall. Fungicides are available to help manage leaf mold. 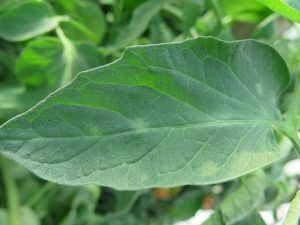 The Midwest Vegetable Production Guide for Commercial Growers 2016 has information on what products are labeled for leaf mold of tomato and what may be used in a greenhouse setting. More information on managing tomato diseases in a greenhouse may be found here. Determine how much yield loss or fruit quality loss is due to leaf mold. Find out if fungicides are necessary to control leaf mold and if so, which ones. Determine if grafted plants have more or less leaf mold and how grafting affects yield and fruit quality. To find out more about our research, watch this space or come to our next field day!